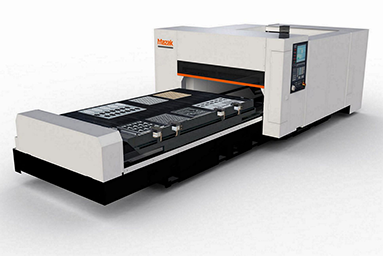 Yamazaki Mazak will be exhibiting its SUPER TURBO-X 3015 laser cutting machine at EuroBLECH 2014, equipped with a new CNC Preview 3 control and higher dynamics feature. The SUPER TURBO-X 3015 is part of the SUPER TURBO-X Series of fixed optics laser machines, which are specifically designed for super-fast, non-stop cutting of a variety of different materials and thicknesses. The 3015 being exhibited at EuroBLECH is a high performance machine equipped with a new Servo Focus Torch that delivers exceptionally high energy density to reduce piercing time for increased productivity. The machine is also equipped with high accuracy Auto Centering Lens and Nozzle design which further reduces setup and increases productivity; a high performance table feed system and rapid traverse rates of 50m/min. In operation, the new Type 10 resonator fitted with an Eco Mode reduces electricity consumption and is capable of a 50% reduction in laser gas consumption and a 43% reduction in air consumption. Accuracy is ensured by the use of a constant beam delivery system that provides uniform cutting performance on all areas of the table and the use of both a high accuracy lens and nozzle. In addition, the 3015 comes equipped with a number of intelligent functions, including Intelligent Nozzle Changer which automatically changes the nozzle based on the CNC programme and material thickness; Automatic Profile Sensor which re-sets and maintains nozzle gap distance; and Automatic Gap calibration which keeps a stable distance between material and nozzle. Intelligent Auto Focal Distance Measurement Adjustment ensures that the focus position is re-set when a lens or its physical characteristic is changed. erformance and accuracy, including pierce detection, an Intelligent Burning Sensor; Intelligent Plasma Sensor and Intelligent Lens Monitoring. The machine is also equipped with Mazatrol Preview 3 CNC control for quick and easy programming and can be used with a variety of automation systems to create individual manufacturing cells of different sizes.